Can a Panasonic Air Conditioning System Service a Larger Room? When you choose Panasonic air conditioning to treat the air in your home, it is a significant investment. One of the crucial choices that a homeowner has to make is not necessarily based upon brand names. Some other factors to consider, include size in kW, the features, the price range, and which model. Making wrong decisions can lead to a lack of performance, earlier equipment failures and inefficiency that could raise energy bills. Typically, a split air conditioning system would be used in smaller homes, but can it be used to treat the air in a larger room? The most important consideration is the size of your system, and any other factors should be based on this decision. The room where the system will be located needs to be accurately sized before the air conditioning installation is carried out. Ideally, this should be carried out by a professional air conditioning technician, and it will be measured in square metres. Choosing the wrong sized system for the room will decrease the heating and cooling performance, leading to a wasted investment. Once you have the dimensions, you will know the size of the system needed, and all the other factors can be decided upon. However, there is more to this process; other factors should also be considered, such as the ceiling height, wall insulation, ceiling insulation, windows and the local climate. As we can see, a well sized split system air conditioner can be used to treat the air in a room that is 60 sqm in size. Air Purification: some systems now feature air purifiers and filters to remove materials, such as bacteria, pollutants, pollen and other particulates, from your indoor air. This is a great option for people that suffer from asthma, allergies, and respiratory illnesses. Reverse Cycle: This will allow you to reverse the system and change it from heating to cooling. Obviously, this can be very useful, but try to ensure that your chosen system can start up and reach the required temperature quickly. The Fan Speed: a good modern system should have a range of fan speeds to ensure that your needs are met. This will allow you to control the climate gently and add a blast of treated air if required, during a heat wave. Remote Control: A remote control unit is essential for the easy operation of wall mounted units that could be quite hard to reach for some people. As an added bonus, get a remote that can turn off the units lights, so there are not bright lights to keep you awake in bedrooms. Economy Mode: Many split air systems have economy modes to increase energy efficiency. This will allow you to reduce your energy bills and maintain a comfortable temperature in your home. If they are looking for Panasonic air conditioning, Perth residents should contact us here at Gas & Air. We supply and install a broad variety of heating and cooling equipment; we also offer a Panasonic air conditioning service. 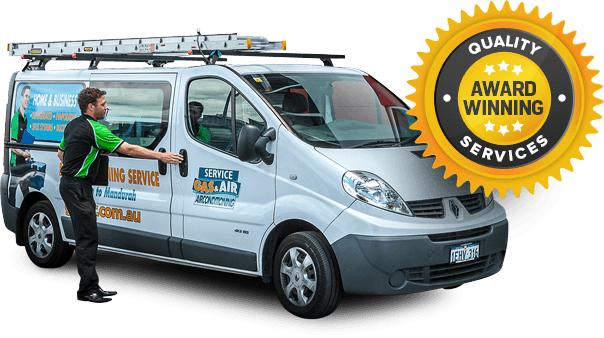 All of our technicians are trained to offer an excellent standard of work at an affordable price. Our sales team is standing by and ready to discuss your needs in greater detail and to answer any further questions that you may have.